In this, the 4th in this series, we discuss what happens when you have poor mid & lower traps activation and how to fix it. The first was an overview of what activation is and why it’s important, generally, in the second we discussed glute activation and a simple exercise to start waking them up, and the third and most recent one was about waking up the lower abdominal muscles, which can help with, among other things, lower back pain. The last most-underrecruited muscle we see in clients is the mid and lower traps. The thing about this is, and this is really important – it creeps up really slowly over time. 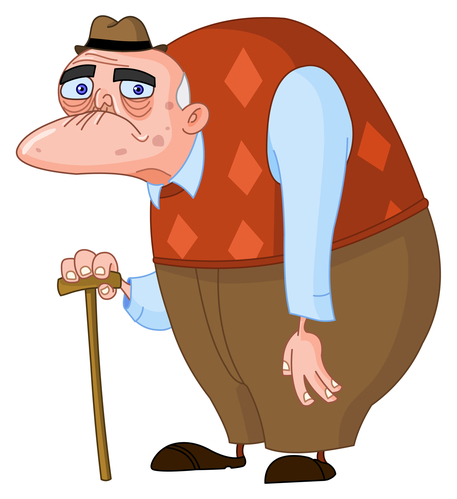 It’s a bad habit of bad posture that slowly, slowly, day by day, gets worse and worse until you get to a point that you can’t – physically can’t – stand up straight. That’s why you need to think about it now. If you’ve ever been to a session with us at the clinic, you know a big part of managing this is stretching out your pecs and lats so you don’t have these tight muscles pulling your forward while you’re sitting. But, as we discussed in the first post, where there is a tightness there’s almost always a partner muscle that’s weak or not activating when it’s supposed to. In the case of this picture, it’s usually the abdominals and the mid and lower traps that stopped supporting your torso the way they should. Almost everyone has heard of ‘the traps’. But most of the time, when you say ‘traps’ (short for trapezius) you think of the muscles at the top of the shoulders, that tend to make bodybuilders’ necks disappear as they get bulkier. Most people don’t realise that the traps are actually in the shape of a kite (or I like to think of it as a diamond shape) on the back of the torso. You can see the traps are pointing to a muscle that starts at the back of the neck, goes out to the tops of the shoulders, and then down in a V-shape along the spine to the middle of the back. The upper traps are usually tight in people who a) work out a lot or b) hunch their shoulders up around their ears. The upper traps very rarely need help with activation. The mid and lower traps, which you can see are the middle and bottom half of the diamond shape, very often need activating. The problem is, when you tell someone to sit up straight they usually pull their shoulders up and together, which activates the rhomboids (you may be familiar with this area as a place where you carry a ton of knots between the shoulder blades). This is another version of bad posture. You think it’s good, but it’s not. 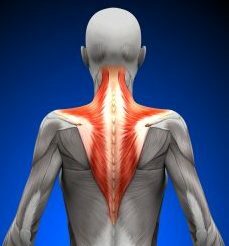 But then you try to tell someone pull your shoulder blades down and towards each other (along the lower diagonal line of the traps) and often they can’t do it. What Problems Do You Get with Low Mid & Lower Trap Activation? The most most most common problem we see is that people simply can’t hold their torso up with the right muscles. b) an overuse of the rotator cuff muscles, lats, and/or rhomboids when trying to have good posture, which can lead to a feeling of pinching or compression in the shoulder, pain & tension between the shoulder blades and sometimes lower back pain. 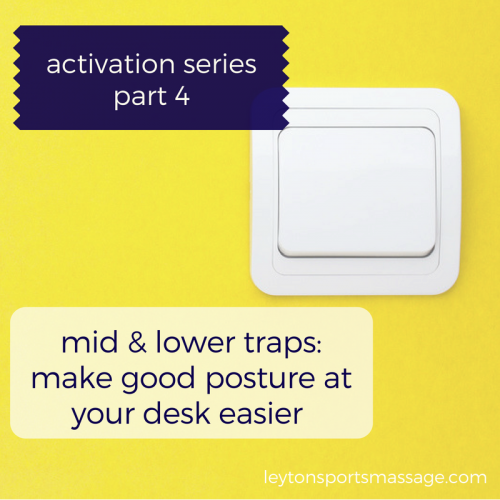 The more you activate and strengthen the mid and lower traps, the easier it becomes to hold yourself up so you won’t feel so tired from trying to sit properly at a desk. Side note if you’re a weights-doer: if your mid and lower traps don’t kick in during rows, and certain pull-downs, you’ll get overuse problems in your lats and rotator cuff which can cause serious shoulder problems. The first step, like with all activation/recruitment issues, is to turn the muscles on. One of my absolute favourites is the Brueger’s postural relief because you can do it at your desk, any time you need help sitting up straight, and you’ll instantly be tapping in to your mid and lower traps. Here’s a video that shows how to do this exercise. He’s not arching his back – you see that when he sits up straight & pulls his shoulder blades down, his abdomen stays flat. Make sure you don’t arch your back forward. He doesn’t open his arms too far around. You are using your shoulder rotators a little in this position, but the focus should be on your lower traps working, not your shoulder rotators. I personally don’t think you need to do it every 30 minutes at your desk, but every time you feel you’re being pulled forward you can do this for 10-20 seconds to open yourself back up. Once you’re totally comfortable with that, you can move on to exercises like a rowing machine (with good form), or a bent over row/row exercises with weights to strengthen these muscles. Remember, we’re always happy to go through Brueger’s with you in a session to make sure you’re using the right muscles. When your postural muscles are weak, they get tired more easily and sitting in good posture feels harder. If you combine the Brueger’s postural exercise above with the abdominal activation from the last article, you’ll find it much easier to sit up while you’re working at your desk for longer periods of time. If you suffer from neck & shoulder pain, we also have a free mini-course on neck & shoulder pain. Click here to go the opt-in page and get the course for free.